The ceremony was fascinating, the setting spectacular... but what people are really talking about is the wedding clothes! 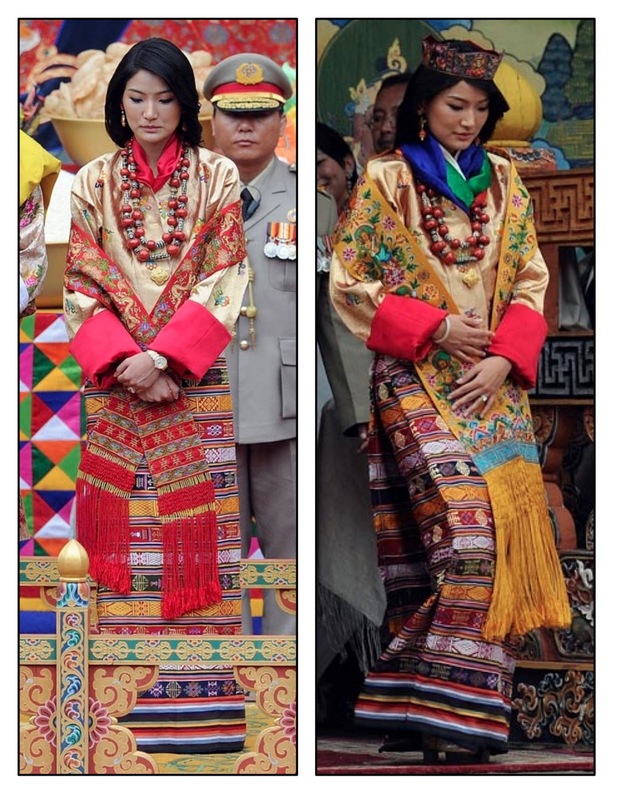 Here is my round up of what His Majesty the King and Her Majesty the Queen of Bhutan wore on their wedding day, October 13th, 2011. They both looked so beautiful! 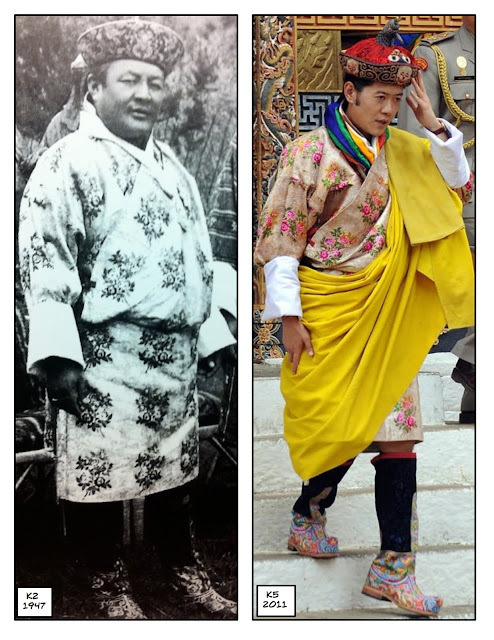 Business Bhutan reporter Yiwang Pindarica writes that, "His Majesty looked stunningly handsome in a golden silk brocade gho which belonged to his great grandfather, the second King of Bhutan. 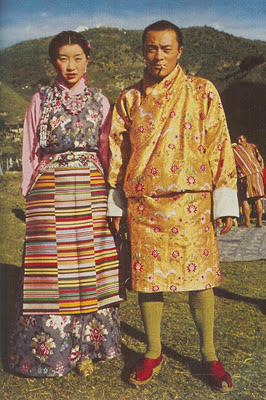 The very same silk gho was also worn by the third Druk Gyalpo during his wedding to Her Majesty the Royal Grand Mother." The 'gho' is the men's bulky robe which is the national costume of Bhutan. 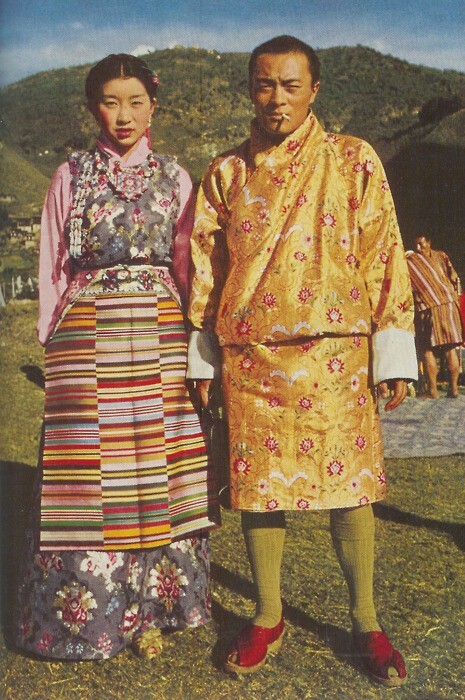 Out of curiosity, I started looking for a photo of the third Druk Gyalpo (Dragon King) dressed in the gold gho worn by the present Druk Gyalpo at his wedding. Instead, in a book presented to me by Business Bhutan, I found this photo of the second Druk Gyalpo wearing the gho in 1947. Although there has been some debate raging on Twitter and elsewhere as to whether this is in fact the same garment, a close look at the flower and leaf embroidered details on the front piece leaves no doubt. How cool to be able to incorporate so many family generations into one's wedding attire! Update! Okay, some people are still unconvinced that these are the same golden ghos. I have done a zoom in as best as I can on the old photo and the new one taken from the same angle. Factoring for the shade difference between the black and white to colour photos (the pink thread disappears in the old photo), I don't really understand why or how anyone can continue to deny the match. Even the side tie is identically located. As noted by @simplybhutan on Twitter, this photo of His Majesty the Fifth Druk Gyalpo shows some fine, loose threads at the shoulder of the gho, indicating that this is not a newly made item of clothing. The King was also wearing traditional Bhutanese boots called tsholham/tshoglham which signal the wearer's rank in society. Only the king can have embroidery on the foot, I think. The tsholham workshop near where I stayed in Thimphu was rushed with orders in the months before the wedding. Actually, the boots look especially great with monochromatic red monks' garments. During the ceremony, it went around on Twitter that His Majesty was wearing his grandfather the Third King's gho. I remembered finding this photo of that King wearing a golden floral gho and I Tweeted it around. Those of us who had very blurry views of the ceremony thought this might be a match, but the people who could actually see what was going on confirmed that this was not the same gho. Similar but not the same. Update: purely for the sake of completeness, here is the Fourth Druk Gyalpo (father of the current King) on the occasion of his official wedding to the four sister Queens in 1988. He is wearing the same golden floral gho that his father is wearing in the 1952 photo above. Many observers thought that the Fifth Druk Gyalpo was wearing this one on his wedding day last week because this is the more recognizable/known piece of clothing. As mentioned before, the two ghos look very similar but the floral pattern is different. Now for Ashi Jetsun Pema Wangchuk, as she will be known henceforth. Thursday was her wedding day but also her coronation so she was dressed with many elements of national and Buddhist symbolism. Business Bhutan reporter Yiwang Pindarica writes that, "Her Majesty the Queen’s wedding dress was chosen according to her traditional birth element. The queen’s birth element is earth therefore she wore a yellow tego. The tego was embroidered with the auspicious eight lucky signs. The kira Her Majesty wore was a Shinglochem [a type of design] with golden threads which matched perfectly with the golden tego and the red wonju. 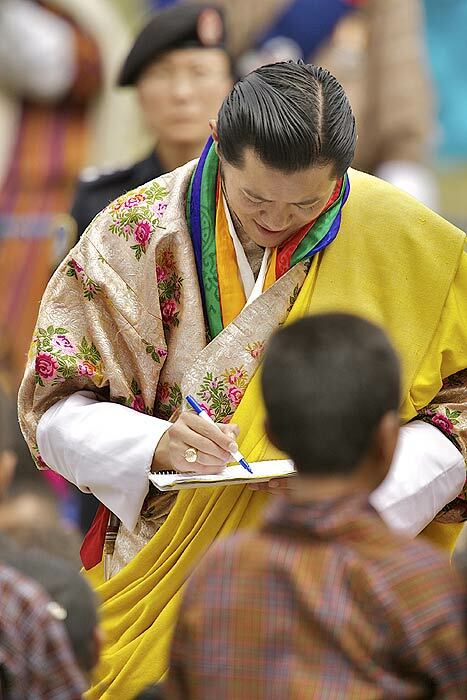 It was gifted to her by Queen Mother Tshering Yangdon Wangchuck [the King's mother]." On the subject of the new Queen's crown, Kuensel reports that the embroidery "depicts two Ja Tsherings (phoenix), the mythical longevity birds. The male and female birds symbolise the blissful relationship between the King and the Queen. It’s also a symbol of inseparability in method and wisdom. The crown also has a khorlo (wheel of dharma) between the male and the female bird. The wheel signifies the power that the King and the Queen is bestowed with to rule in a way that launches the country into a new era of continued peace and prosperity. The lotus beneath the khorlo is for purity of love and devotion for both the King and the Queen." On the third day of the wedding, Queen Jetsun wore a stunning gold and jade crown which also had images related to Buddhism (photo below). The Queen's shoes were of a modern stacked heel style but were covered in traditional embroidery. There appears to be a mountain landscape on the heel. She was also wearing red coral and dzi bead necklaces and a double vajra gold brooch which is part of Bhutan's national emblem. 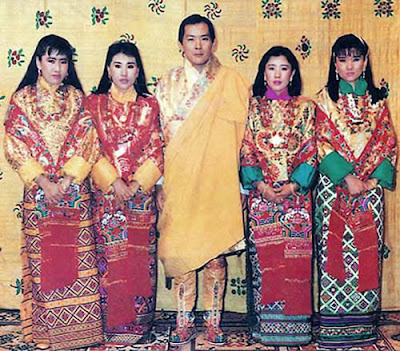 Jetsun Pema arrived at her wedding ceremony wearing a red rachu (long ceremonial scarf) but after her coronation, she emerged wearing a gold one. Business Bhutan reports that "This is the first time a queen has worn a darker shade of yellow racchu." My guess is that this is to partner with the gold kabney (large wrapped garment) that His Majesty wears. Her gold rachu has amazing embroidery of goddesses and flowers. I especially like the bright green accents. The Queen's red and gold rachus. Both photos from NDTV. In my culture, the tradition of a bride wearing only white originated with another royal wedding, that of Queen Victoria in 1840. Personally, I prefer colourful traditions to colourless ones. I am not an expert on Bhutanese fashion or ceremonial clothing. This info is all what I garnered from research. Please correct me where I am mistaken or have overlooked something important. Thanks. PS: I have improved the K2/K5 gho picture because it has become so popular. Please cite the two source photos as listed and this blog post if you are going to post the image elsewhere. Thank you. Hi, I just came across your updates, and I'm sure you must be tired of the 'is it the same gho' debates, but my two bit.....the ghos worn by the fourth king and the third king are different. :P I was very interested in the ghos, so i have been looking (much too closely) at them, and I saw once a large-ish picture of the fourth king seated with the four kings, and that gho did not have the white winglike design on it. i wish i could find a clear picture online but unfortunately i havent been able to.